One of the most anticipated celebrations in Thailand is the Chinese New Year. Although it is not a public holiday, it is just as important as Songkran for a significant proportion of the Thai population. About 14% are of Chinese descent, thus representing the largest minority group in Thailand. Today’s Sino-Thais are well integrated into the Thai society. Nonetheless, Chinese specific traditions still play a vital role in their lives. In the days leading up to Chinese New Year, you will likely encounter many shops owned by Chinese descendants that are decorated in red – the Chinese color for luck and happiness. The festival takes place on the first day of the Chinese Lunar Calendar, usually around January and February. The exact date in 2019 is February 5. 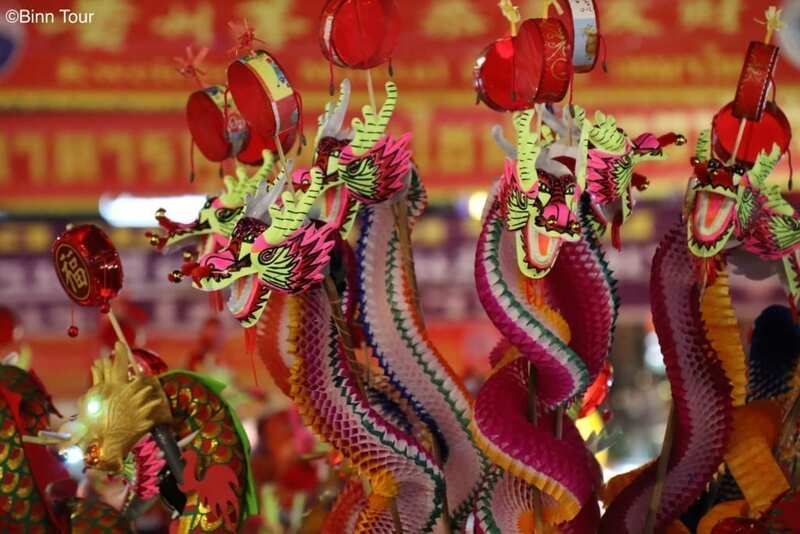 According to ancient Chinese folklore, an evil serpent called “Nian” would come out on the night of New Year’s Eve to ravage the homes of people. To protect oneself, one has to wear red clothes, put up red things at home and set off firecrackers. The loud noise and the strong color are believed to scare away the beast and other evil spirits. 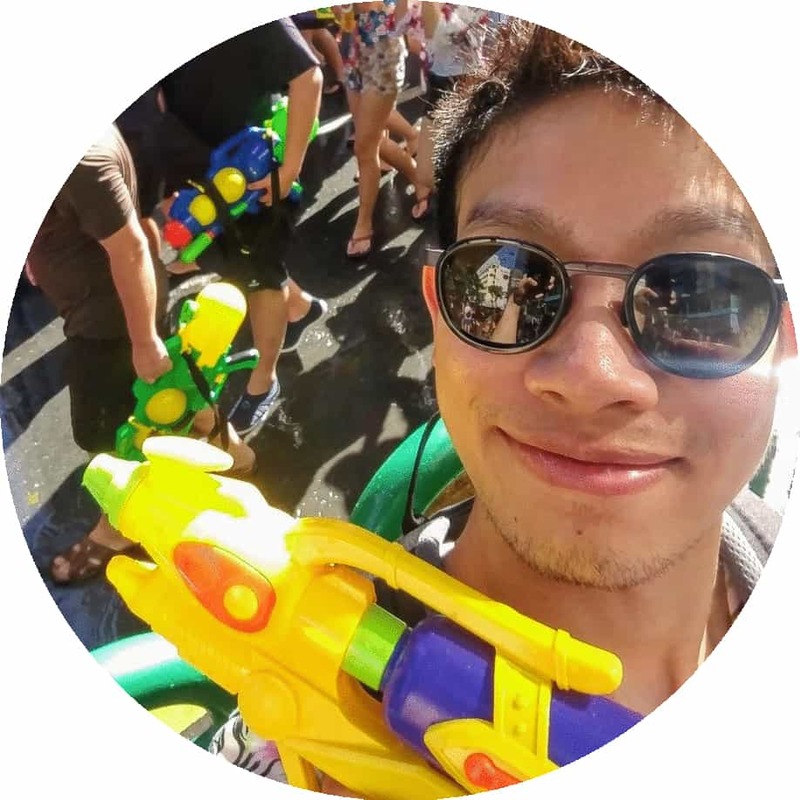 Similar to Songkran, Chinese New Year marks a new beginning and is therefore an opportunity to get rid of bad luck and start afresh. An essential part of the tradition is to pay respect to the gods and one’s ancestors. This will bring good fortune in the upcoming year. Furthermore, it is a special occasion for family members to gather and enjoy a meal or travel together. In fact, the number of air travels in Thailand is highest in the period of Chinese New Year! Before New Year’s Day, one must clean their home to allow good fortune to enter in the new year. On New Year’s Day, however, one must absolutely refrain from doing any kind of work. Sounds easy, no? In the old days, people would take a day off and rest. But things are a little bit different nowadays. 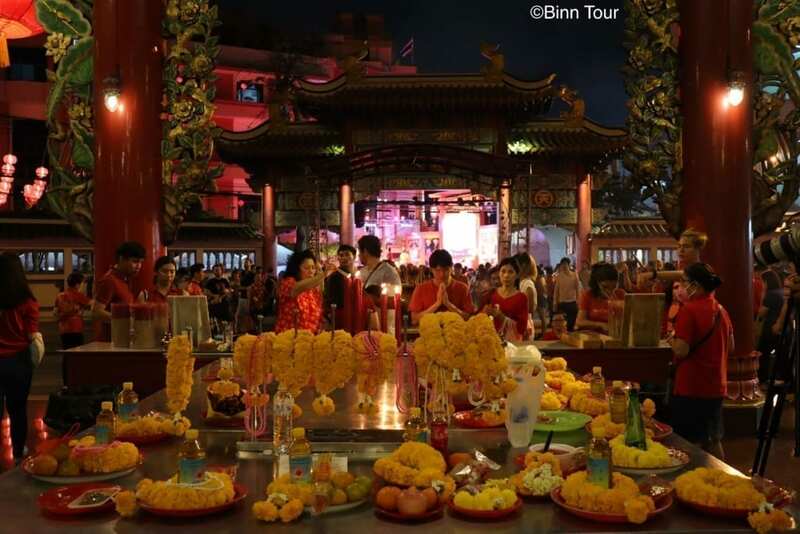 For shop owners and restaurants in Bangkok’s Chinatown, Chinese New Year is one of the busiest days in the year! 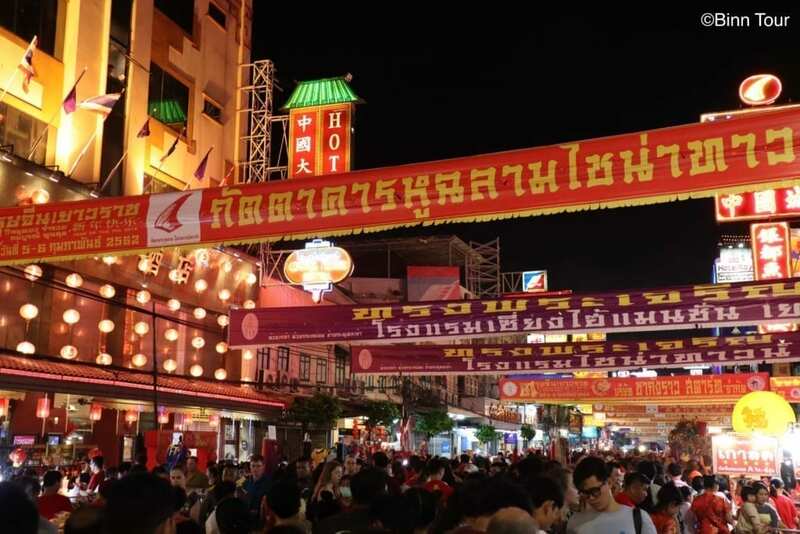 To enjoy the full vibe of Chinese New Year in Bangkok, head to the city’s very old and authentic Chinatown, also known as Yaowarat. The main street (Yaowarat Road) literally turns red and becomes the center stage of this highly animated festival. 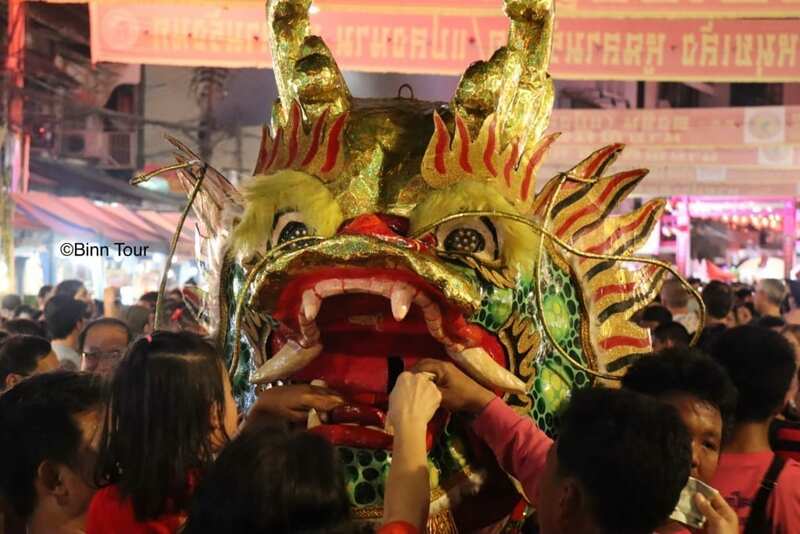 Street parades and dragon dances will provide visitors with thrilling sights and sounds. Even with the current air pollution, it’s hard to imagine Chinese New Year in Yaowarat without the dragon dance and the smell of firecrackers and burnt incense from nearby temples. The opening ceremony of Chinese New Year in Yaowarat is typically presided by Her Royal Highness Princess Sirindhorn. 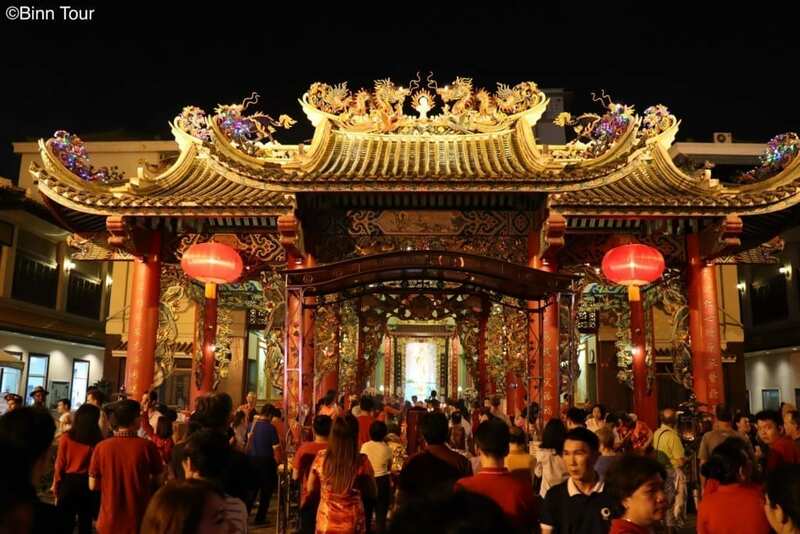 The main part of the celebration, which includes the dragon dance performance, usually starts around 8 pm near the Gate of Chinatown and lasts until the late evening. As with almost any festival in Thailand, there will be plenty of street food everywhere. If you decide to go to Chinatown, it is worth visiting Wat Mangkon Kamalawat (or Wat Leng Noei Yi) and the Kuan Yin Shrine near the Golden Temple. To get into the spirit of Chinese New Year, come dressed in red. Also, there are a few things to avoid on New Year’s Day, such as doing any kind of work including house chores, talking badly, killing and breaking things. Even washing your hair is off limit. If you believe the superstition, the rest of the year will be determined by how you act on New Year’s Day. If you work hard on the first day, expect an equally busy year ahead! Taxis are always an option, but you may run into rush hour. As Yaowarat Road will be closed to traffic, the driver will drop you off somewhere nearby. Alternatively, you can take the Chao Phraya Express Boat from Saphan Taksin (BTS: Saphan Taksin on the dark green line) and get off at Rajchawongse (pier station number 5). After you get off from the pier, walk up the street until you reach Yaowarat Road and turn right. Keep in mind, however, that the boat service only runs until 7 or 8 pm. Finding a taxi to leave Chinatown once it’s packed will be quite a challenge and easier if you walk away from the main street. Third option: Take the MRT to Hua Lamphong station and walk towards the Gate of Chinatown (east side of Yaowarat Road). It’s about a ten minute walk. If you opt for the MRT, I highly recommend getting a stored value card (with sufficient topping) or a regular single ticket for the return in advance. Most people will use the MRT after visiting Yaowarat and the queues at the ticket machines will be very long.